The President and Management Committee request the pleasure of your company at the 62nd Annual Supper to be held Sat. 1st June 2019 at Diss RFC, Bellrope Lane, Roydon, Diss IP22 5RG 7pm for drinks and cocktail sausages (courtesy of Greene King and Musk’s) 7.30pm sit down. The AGM will be held prior to the Dinner at 6pm. We are pleased to advise we have Professor Mark Bailey High Master at St. Paul’s School as our speaker this year. 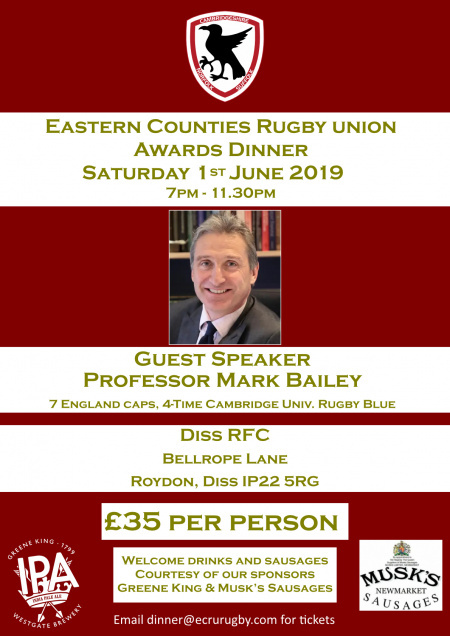 Mark was educated at Ipswich School and played for Ipswich RFC before moving on to Durham University and the University of Cambridge, captaining the latter in the 1983 and 1984 Varsity matches. He won four Blues at Cambridge. He later served as Secretary of CURUFC, as its representative on the Rugby Football Union, and since 2010 has been President of the club. Mark played on the wing for Bedford in 1981–2 and for London Wasps between 1984–90, winning the premiership in the 1989–90 season. He also received International Honours for England, capped seven times, and played for the Barbarians invitational side. On 16 June 2003, Mark was honoured with Durham University's Palatinate Award for Sport. The 2019 E.C. Presidents Volunteer Awards will be presented and those with England honours will be recognised. The league winners will receive a Shield to mark their performance in winning their respective Leagues in 2018/2019.